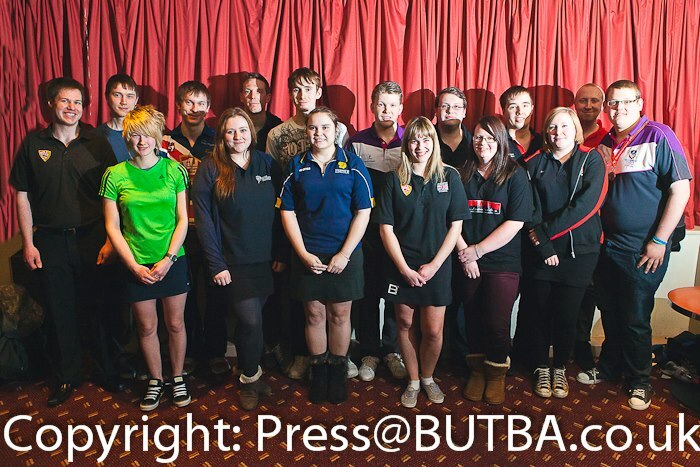 The highlight of the student bowling calendar is the BUCS Gatorade Nationals which this season took place in Sheffield (at 1st Bowl, Firth Park) on the weekend of the 23rd/24th February 2013. 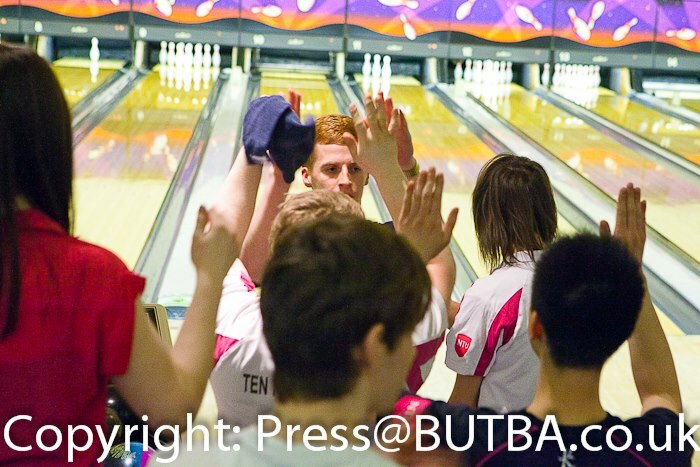 British Universities and Colleges Sports (BUCS) is the organisation that governs almost all student level sport in Great Britain, and Tenpin Bowling comes under its remit. The BUCS Tenpin Bowling Championships (this year sponsored by Gatorade for the first time as part of a weekend of BUCS Championship events in a variety of sports in Sheffield!) 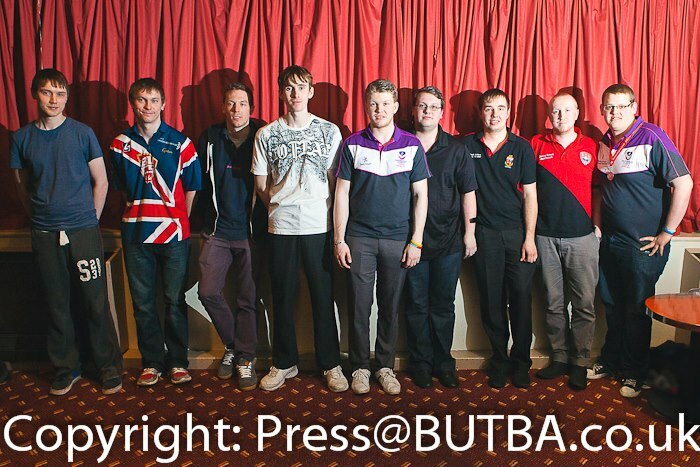 has long been the flagship event of student bowling (previously known as the BUSA Champs and before that the UAU Champs), as Universities and Colleges across the land compete with each other to win or place as highly as they can at the bowling championships and at as many different BUCS sporting events as they can, thus enhancing the sporting standards of their institution. The tournament format has remained essentially the same since its inception in the 1960’s (we have winner’s records stretching back to 1968 when Manchester were the Men’s Champions, with Leeds seemingly being the first ladies champions in 1970! ), it’s a combination scratch pinfall event with teams of 6 men and 4 ladies (ladies teams were reduced to 3 members in 1997) competing over 9 games of bowling, split into three 3-game sets, with the team with the highest total pinfall being declared the winner. 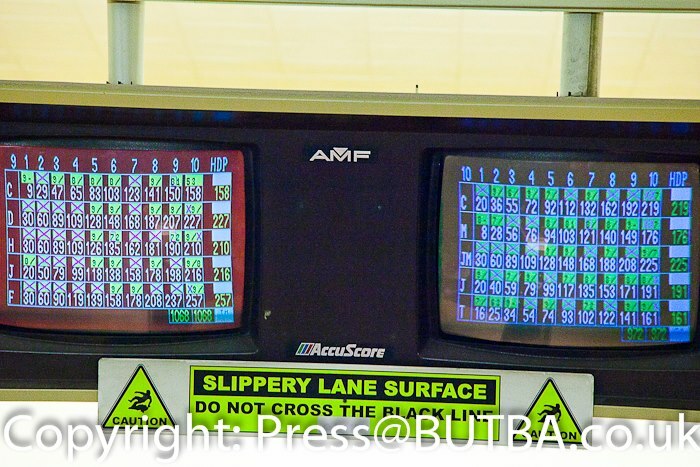 As each bowler has to bowl three different sets, the event organisers decided to put down a different oil pattern for each set, short, long and medium respectively, to try to provide a more challenging bowling environment. 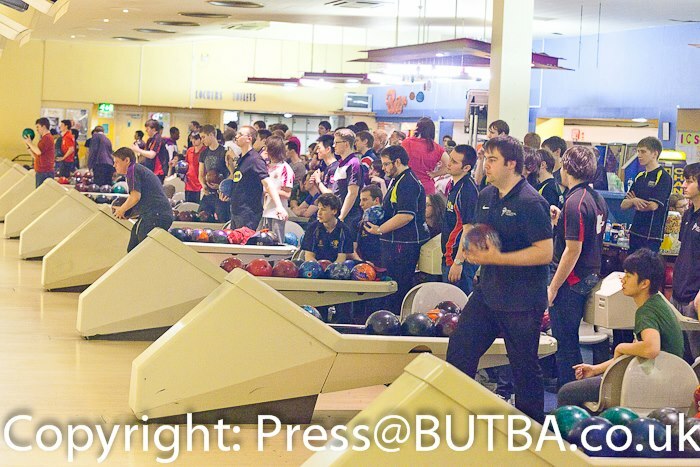 The championships have been bowled at AMF (now 1st Bowl) Nottingham ever since their inception, but this season for various reasons the decision was taken to move the venue to 1st Bowl (Firth Park) Sheffield. The event is bowled over two days, usually with everybody bowling just 3 games on the Saturday and the remaining 6 on the Sunday, however due to the smaller size of the Sheffield Bowl, it was necessary for a few members of some teams to bowl 6 of their games on the Saturday. In the Men’s team event, Nottingham University got off to the best start with a very impressive 465 doubles game from Frazer Bowen (240) and Grant Rayment (225) although they could only manage an 1181 series, and it fell to Loughborough A’s Matt Fidgett (678) and Mike Hurst (636) to record the best doubles series of the championship with a very nice 1314 pins including a 471 game! Loughborough A was the only team in the competition to record two doubles sets in excess of 1200, with Jordan Wong (635) and Matt Harris (604) hitting 1239. Warwick A were the best of the rest with a very creditable 1274, courtesy of the individual leader after 3 games Jack Adams (690, having started the tournament with a 258 game) with able support from Tom Prickett (584). Followed by Manchester (1239), Chris Lam and Lewis Brown; Portsmouth (1223), Jon Spivey and Chris Hunnisett; and Notts Trent (1220), Tom Chuter and James Madden. After all bowlers had completed their first 3 games, Loughborough were the clear leaders on a total scratch pinfall of 3613 (an average of 200.7 per bowler), with Notts Trent (3429) in second place, Portsmouth (3212) 3rd, Warwick (3185) 4th, and Manchester (3117) in 5th. The hunt for the individual title was led off by Jack Adams (690), closely followed by Matt Fidgett (678), then Jon Spivey (646) 3rd, Chris Lam (639) 4th, Mike Hurst (636) 5th, Jordan Wong (635) 6th, Aiden Wright (633) 7th, Paul Symons (632) 8th, Carl Whitfield (631) 9th courtesy of a new PB game of 264, and Tom Chuter (624) 10th. Meanwhile in the ladies competition, it was absolutely a one horse race, with Leeds Met making all the running. 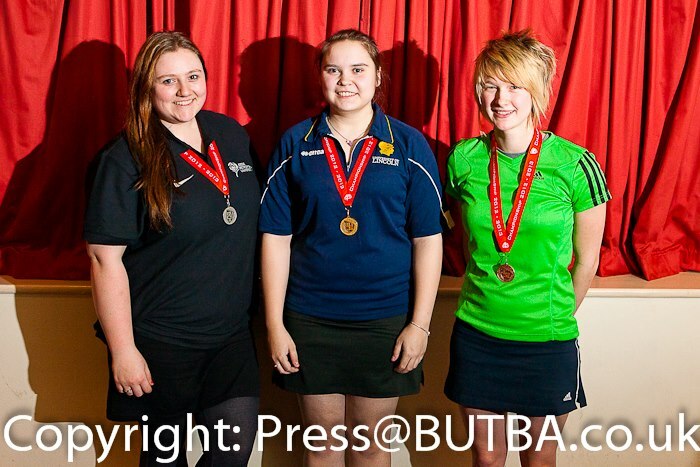 The doubles partnership of Tiffany Knock (592) and Terri-Anne Faulconbridge (582) hit an unbeatable 1174, whilst Rachael McKenzie kicked off her tournament in style with a 654 series in the singles, giving them a team total of 1829 over the first 3 games (an average of 203.22 per bowler, better than any of the men’s teams managed!). Their nearest rivals were Notts Trent way back on 1444 pins after a 1058 doubles from Jordine Lam (572) and Kirsty Ralph (486), and a singles from Chelsea Potter (386); just ahead of Imperial (Hui Erh Tay, Xin Yan Goh & Hamizah Nor) on 1404. 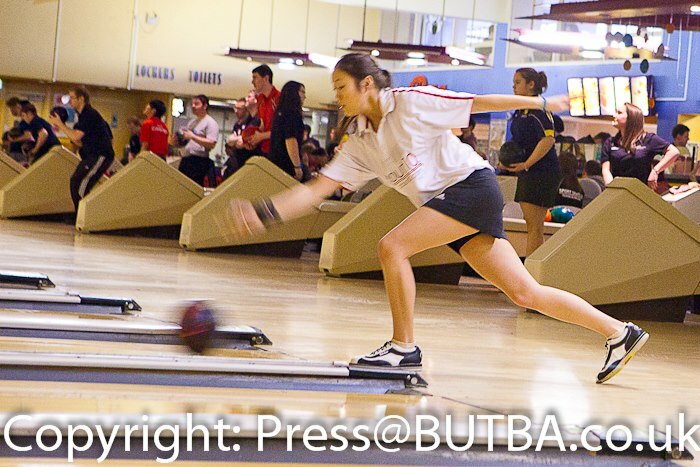 Hannah Bratton-Smith (Kent) took the initial lead courtesy of her 655 series, just a single pin ahead of Rachael McKenzie (654), with Hui Erh Tay (601) 3rd, and Tiffany Knock (592) and Anne Windess (Warwick – 592) 4th equal. The men’s trios saw Notts Trent come out firing on all cylinders with a whopping 1956 trios series from Jon Atkins (712), Tom Chuter (682), and Mike Chan (562); which included a 716 team game. 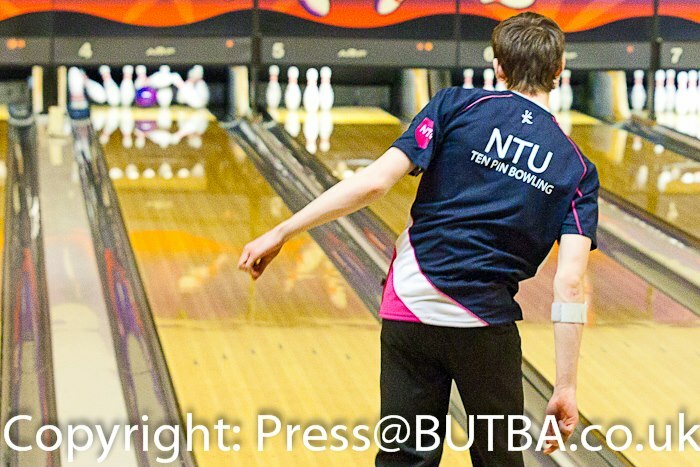 Leeds Met (1856) were the next best team thanks to 647 series from both Adam Walton and Adam Leefe, keeping them ahead of Birmingham (1829) despite the massive sets put in by both Stephen Hibbert (675) and Sam Bond (673). Portsmouth (1828) were the only other team to breach the 1800 boundary, with most of the legwork being done by Chris Hunnisett (648), with the 5th best set coming from the other Trent trio with 1778! We had a new lead team after the trios, with Notts Trent (7163) just sneaking ahead of Loughborough (7036) on total pinfall over the first 6 games, with Portsmouth (6616), Warwick (6529) and Manchester (6286) maintaining their relative positions. So with just 3 games to go, it was shaping up a straight shoot out between Loughborough and Trent for the championship, with Portsmouth and Warwick left to fight for the bronze medal! 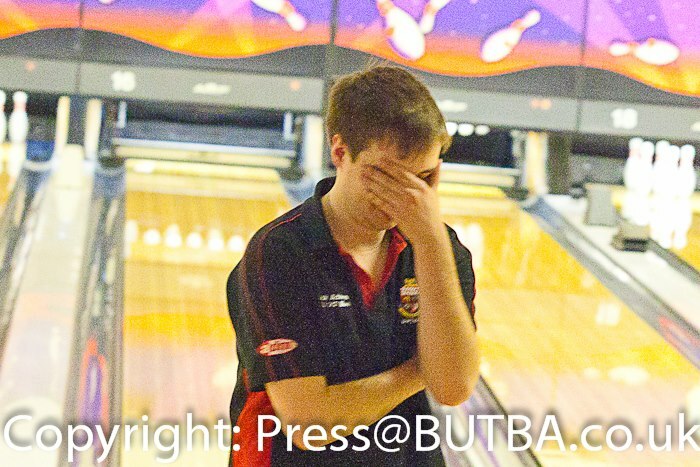 The best individual series bowled in the trios was Jon Atkin’s 712, although Jamie Kingston (699) deserves special mention for bowling his PB game (264) and series, whilst unluckily chopping a pin in the tenth frame of his final game to be denied his first ever 700 series! Aiden Wright came to life in the trios hitting a 679 series, as did Curtis Berry (653 – bowling out of his skin less than 1 year after taking up the sport! ), Chris Hunnisett (648), Adam Walton (647), Adam Leefe (647), Danny Crook (644 – beginning to recover after a disastrous start! ), Paul Turner (640) with Jack Adams (639) consolidating his early lead. After 6 games bowled, Jack Adams (1329) was still leading just ahead of Aiden Wright (1312), with Tom Chuter (1306) 3rd, Matt Fidgett (1304) 4th, Jon Atkins (1262) 5th, Jon Spivey (1259) 6th, Adam Walton (1249) 7th, Jamie Kingston (1246) 8th, Paul Turner (1240) 9th, and Jordan Wong (1230) 10th. Leeds Met (1606) continued their majestic progress in the ladies’ trios, they didn’t bowl as well as they had initially, but they were still streets ahead of their nearest opposition, with Rachael top scoring in the team on 558. An improving Nottingham Trent (1513) couldn’t prevent the gap from widening, despite an ultra-consistent series from Jordine (194, 191, 193 – 578), and Imperial (1281) also slipped further behind. Rebekah Hamlet (684 – Lincoln) blew off the cobwebs and put in an absolutely corking set in the trios to make up for a poor start, and none of the other ladies could muster an adequate reply. 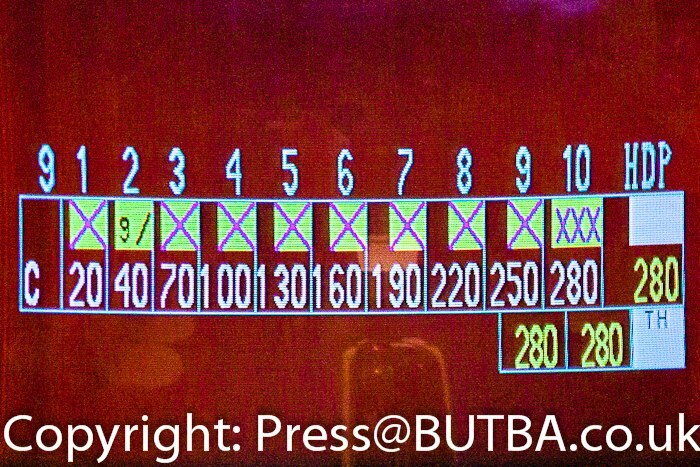 Jordine’s 578 was the next best series bowled in the trios! Rebekah’s series took her from 9th place to joint 1st overall on 1217 pins with Hannah Bratton-Smith; just ahead of Rachael McKenzie on 1212 in 3rd. Jordine Lam (1150) and Tiffany Knock (1148) in 4th and 5th respectively suddenly found themselves a long way off the pace! really did read that correctly 817! ), with 269, 280 and 268 games…mind you I suppose we should have expected something this amazing from the number 1 ranked U24 bowler in the country! This is far and away the best series ever bowled in ANY student competition in this country (and our records stretch back almost 50 years! ), beating the previous record of 801 set by Rob Kendall (Surrey) at AMF Purley back in 2005! Whilst everyone was watching and marvelling at Chris Lam’s silky smooth bowling, Danny Crook (Leeds Trinity) quietly got on with some pretty impressive bowling of his own, hitting 279, 247, 237 for a 763 series, which would almost certainly have beaten the old tournament record! The other bowler’s in the singles acquitted themselves well, but their scores just can’t compare to Chris and Danny’s. Stephen Hibbert (Birmingham) was the best of the rest on 662, Jon Atkins (650 including a 279 game), Cameron Whitehead (633 – Sheffield Hallam), Jon Spivey (625). Crucially Mike Hurst (507) of Loughborough struggled in the singles, giving Notts Trent a larger cushion at the start of the fives! into 5th. The tournament organiser (Darren Ellis) had the foresight to schedule the teams likely to be contesting the championships on the same pair of lanes, which led to a great finale to the event. 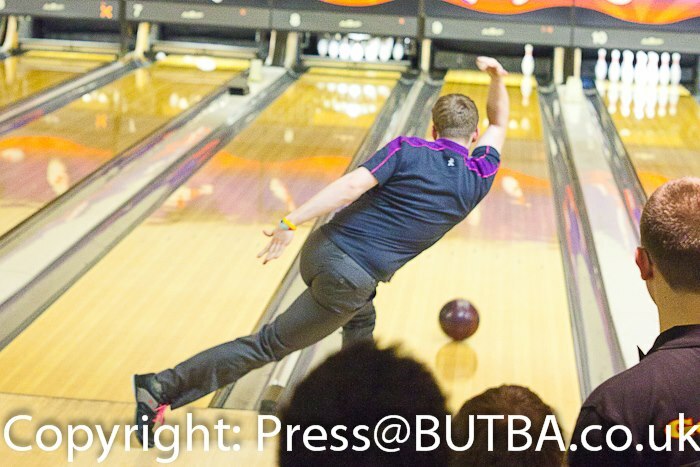 Loughborough started strongly with a 932 game whilst Trent could only manage an 836 game, so one game in and the deficit was already down to 174 pins, meanwhile Warwick posted a 992 game claiming back over 100 pins on both Manchester (883) and Portsmouth (881). Loughborough pulled out all the stops in the second fives game, hitting a very impressive 1068 game, but although Trent couldn’t match them, they managed to hang on to their coat-tails and hit a 972 game, so Loughborough only gained back another 96 pins, but did cut the deficit to a meagre 78 pins with just one game to go! Warwick (929) put in another decent game and gained a little more ground on both Portsmouth (869) and Manchester (838). In the final game Loughborough just couldn’t seem to buy a strike, and although Trent wasn’t putting in a particularly impressive score either, they kept their nerve, made their spares and managed to stay comfortably ahead of Loughborough throughout the final game, and thus avoid any nervous last frame antics. The final game ended 891 to 836 in Trent’s favour, and Nottingham Trent (with a total of 10512 pins, a 194.7 bowler average!) 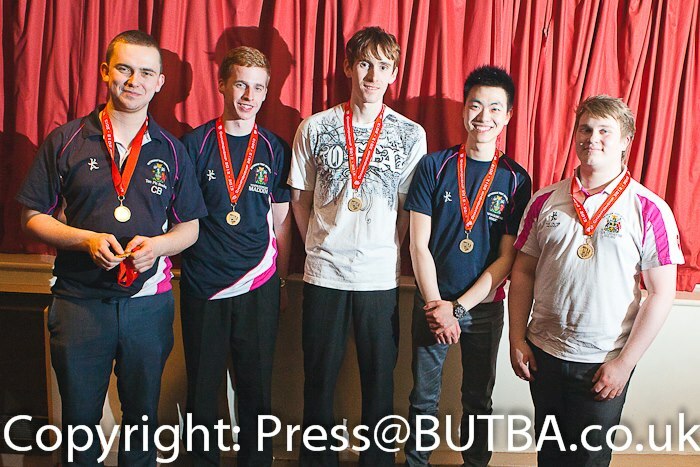 were duly crowned BUCS Champions 2013 with a winning margin of just over 100 pins over Loughborough (10379), who had to settle for silver! We believe that Trent’s total is the second highest ever recorded in the almost 50 year history of the championships! The winning team from Trent consisted of Jon Atkins (5th, 212.4 av. ), Tom Chuter (Captain, 8th, 209 av. ), Curtis Berry (19th, 197.7 av. ), James Madden (26th, 192.3), Jonny Walker (34rd, 185.7), and Michael Chan (46th, 170.9). Warwick (909) gained more pins back on both Portsmouth (874) and Manchester (854) in the final game, but while this proved enough to move past the latter, Warwick (total pinfall 9824) didn’t quite do enough to overtake the former (falling a mere 35 pins short! ), and so had to settle for 4th place, with the bronze medals going to Portsmouth (9859)! Loughborough had won the last 4 Championships, and have a total of 6 titles to their name, whereas Nottingham Trent has always been the bridesmaid never the bride (with three second places to their credit! ), so to finally win the title is a truly remarkable achievement, especially as the club had completely fallen off the scene 3 years ago, and was assumed to have been disbanded! Well they’re back now, and with a vengeance, who’d want to bet against Nottingham Trent going on a winning streak of their own? 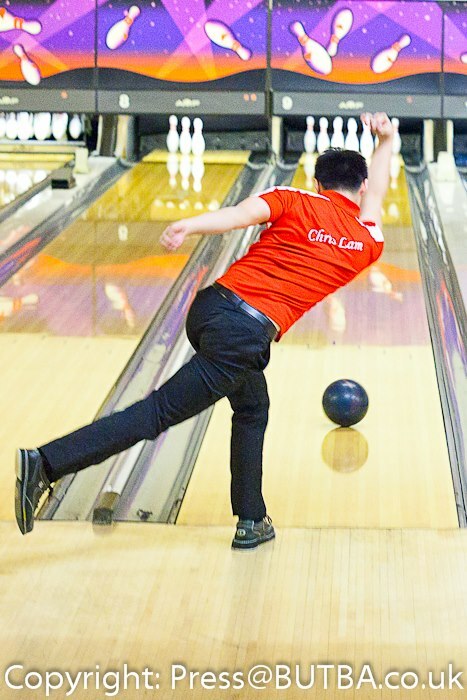 The individual championships were won by Chris Lam (Manchester) who’s 817 catapulted him from 15th to 1st place, catching everybody by surprise, giving him a 9 game total of 2040 pins (a 226.7 average), a mere 6 pins shy of the individual championship record of 2046 set by Antony Lakey (Portsmouth) in 2010. This was Chris’s first appearance at a student tournament, we hope to see him at many more of our events in the future, but I confidently predict that if we do, a lot more student records will be receiving the Chris Lam treatment! Jack Adams (1969) finished with a 640 to hold on to second place, just ahead of Matt Fidgett (1959) in 3rd, who shot 655 in the fives…both men were involved in crucial dogfights for team placings, so did really well to keep up such a high standard of bowling. Aiden (1927)dropped to 4th despite a solid 615, whilst Jon Atkins (1912) maintained his 5th place, Danny Crook’s (1907) amazing last set pulled him all the way up from around 30th to 6th, Jon Spivey (1884) finished with a 625 and slipped down 1 place to 7th, Tom Chuter (1881) in captaining Trent to their first ever victory perhaps wasn’t as focussed on his own bowling as he could have been, and slipped down to 8th, Chris Hunnisett’s (1865) finish (640) was enough to gain him 3 places and finish in 9th, Lewis Brown (1852) also finished strongly (636) and jumped up from 16th to 10th! Leeds Met Ladies in the singles made it even more emphatic, Rachael McKenzie (650), Terri-Anne Faulconbridge (610, hitting a 276 in the final game of the day! ), and Tiffany Knock (543) all excelled themselves. Leeds Met finished with a total pinfall of 5237 for an average of 193.96 per bowler, and as far as we can tell, that is also a new championship record, destroying the previous total of 5087 set by Sheffield in 2007…not bad for a club that’s never placed in the top 3 at the championships before, let alone won the title! Nottingham Trent (4385) couldn’t compete with Leeds Met, but they did achieve a very well deserved 2nd place, like their Men’s team placing one place higher than they ever have before. This was in no small part due to the amazingly consistent Jordine Lam (for those of you who were wondering she is Chris Lam’s sister!) 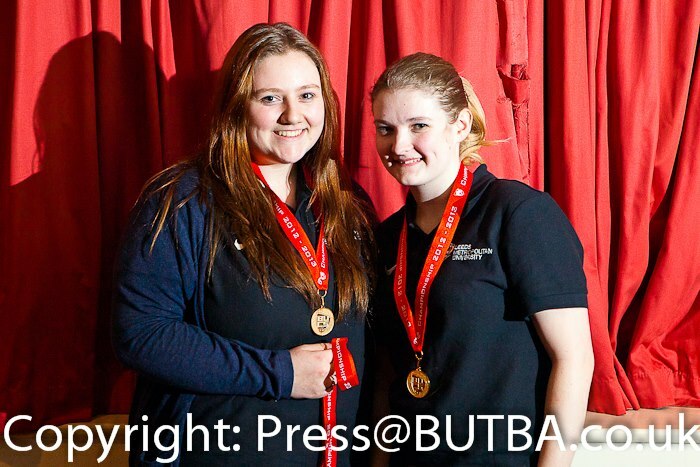 who averaged 191.8 by bowling 3 consecutive 570 series (572, 578 & 576), but also to the above average contributions of both Kirsty Ralph (160.9) and Chelsea Potter (134.6). Imperial College (4165) secured the bronze medal position with solid bowling throughout their team, and a standout performance from Hui Erh Tay (187.2 av.). singles to run away with the individual title (she actually averaged 243.6 over her last 5 games!). We think that her total pinfall for the tournament of 1930 (that’s a 214.4 av.) is also a new record for our tour, beating the previous best of 1881 by Hui Yiang Tay (Sheffield) from 2007! Rachael McKenzie’s 650 odd series to both start and finish the tournament ensured that she secured 2nd place in the individual championships, for a third time! Her total pinfall of 1862 on this occasion would have been enough to secure victory on either of those prior occasions, but unfortunately she ran into a bowler on terrific form again this time out! Hannah Bratton-Smith finished 3rd on 1779, ahead of Jordine Lam (1726) in 4th and Tiffany Knock (1691) in 5th. As well as competing in the team and individual championships, the higher averaging bowlers also get the chance to try-out for the BUCS Tenpin Bowling Team whilst bowling in the Championships. This team is effectively the British University Tenpin Bowling Team, and securing a place on the team is the highest accolade a student bowler can achieve (apart perhaps from captaining said team! ), so the pressure is intense! Men: Danny Crook (c), Mike Hurst (v/c), Chris Lam, Aiden Wright, Matt Fidgett, Lewis Brown, Jonathan Spivey, Jack Adams, Jon Atkins, Stephen Hibbert. Women: Rachael McKenzie (c), Anne Windess (v/c), Rebekah Hamlet, Hannah Bratton-Smith, Jordine Lam, Tiffany Nock, Rachel Hodds, Terri-Anne Faulconbridge, Rachael Sargent, Chloe Wright. 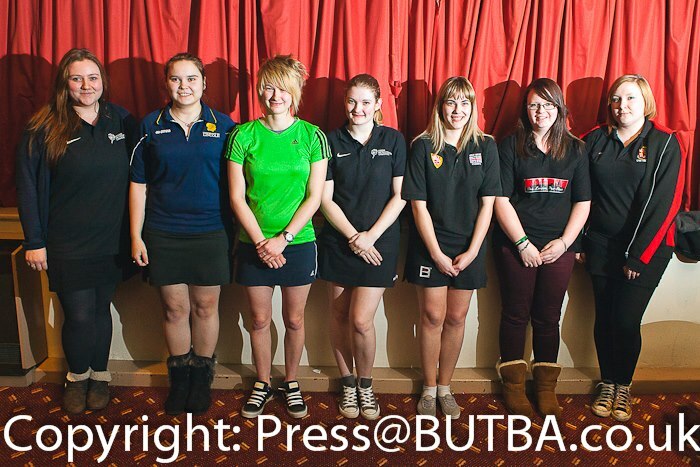 I think that as always the team selectors have chosen well, and we have a formidable line-up of bowlers to choose from for any of the upcoming BUCS matches…I can’t wait to see our men and women representing the whole of University Bowling again…are there any teams out there that are up to the challenge?